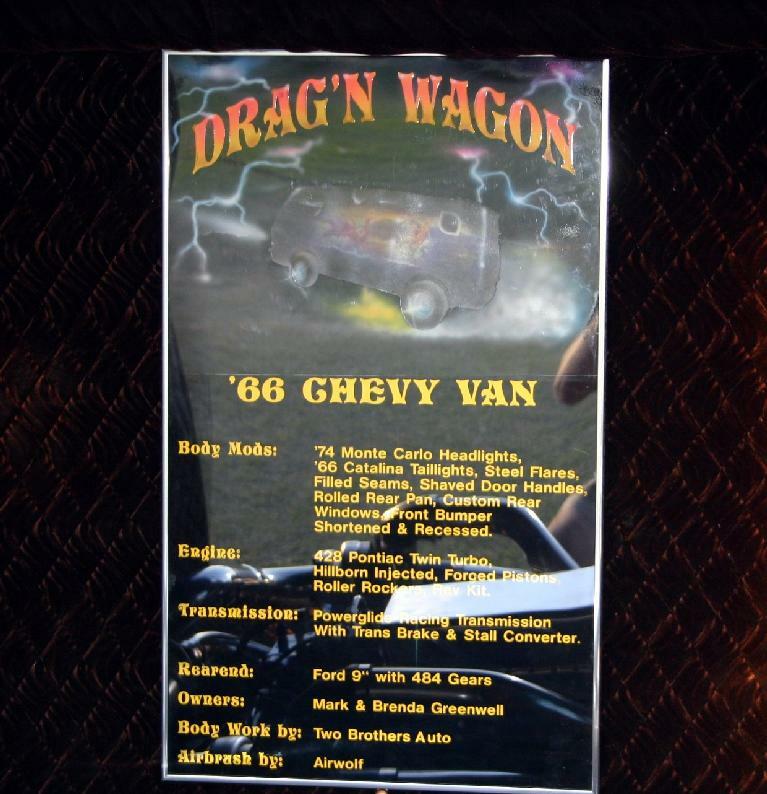 So you’ve owned it since you were 16?Yes.And that was when?1973.So then, what’s the next obvious question…Why’d a 16 year old kid buy a van?I’m a drummer! I hadn’t looked inside yet. 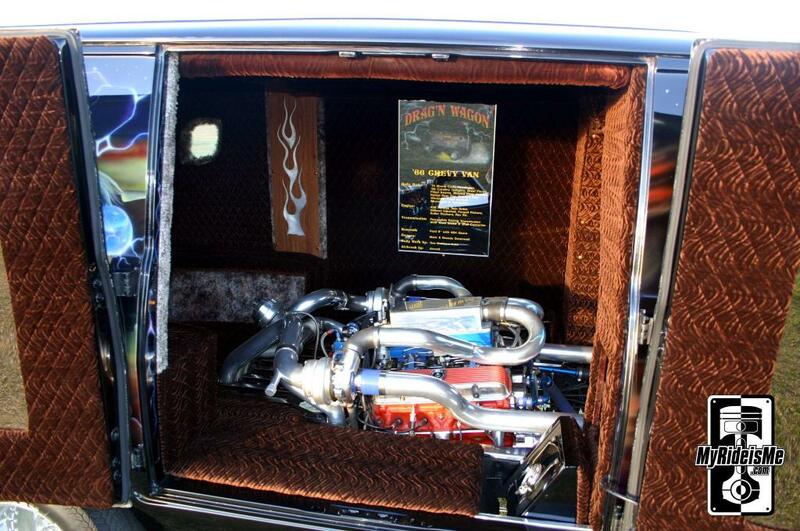 You’re looking at a twin turbo 428 Pontiac with and Hillborn Fuel Injection backed by a Powerglide trans with race converter and trans brake.All this is center-mounted, In the van! It’s not just for show either.Mark shared his near success story of the first time he drag raced the van.He’d gone 7 rounds, all the way to the finals.There’s always some luck there, but Mark had a head start on all the other racers. Then in the final, racing a super comp car, he’d be way out front.After a clean start, racing to the first stripe on the drag strip, he’d won!Sure, the full-tilt race car had passed him, but it was too late.The weird thing was, the time slip showed Mark losing.What gives?Mark learned the hard way that the first stripe is the mile per hour line and that the SECOND line was the finish.Later on, Mark’s turned a best 12.48 @ 148 mph in Lancaster/Palmdale raceway, but a near miss with the throttle stuck open retired the van from racing.To go fast and be safe, Mark started working on a dragster. Mark and his van show the meaning of My Ride is Me.I encourage everyone to build what you like and have fun doing it.Mark certainly is and it was my pleasure to meet him.Here’s the show card to fill in what I missed and give proper credit to Airwolf, the airbrush artist who did the murals. 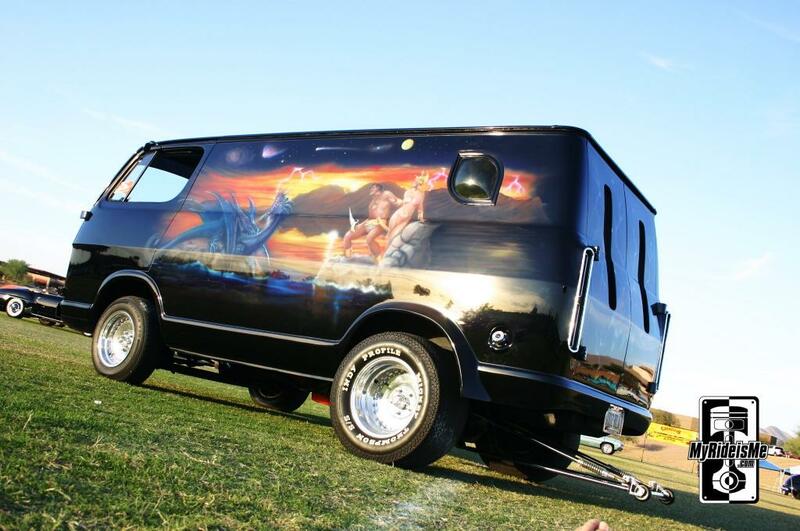 Do you dig the van? Do you often take pictures with your toe in them. . . ?? That is a great looking van ! Nice retro mid 70’s look to it with the Monte Carlo quads and the mural. Hope to see it in person one day. 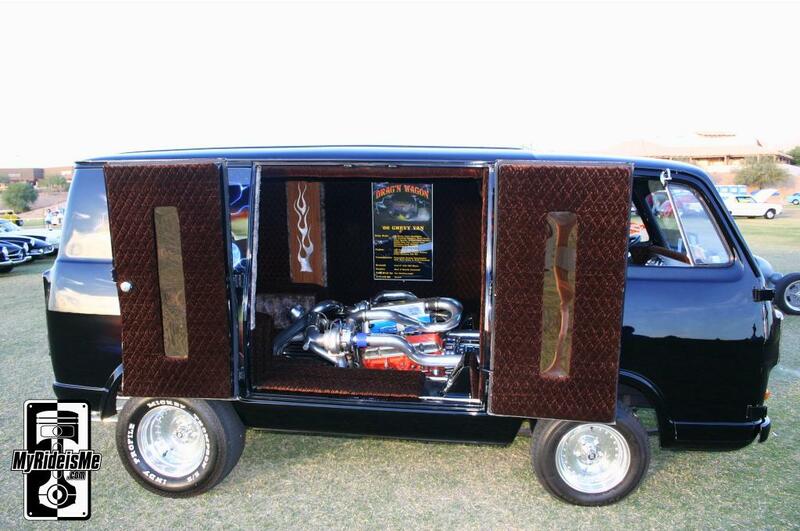 Would love to be able to put it on my van related website for all the custom van fanatics to see.